Why a cheetah is faster than an elephant… and a wolf is, too. The cheetah is the fastest land animal on Earth. No surprise there - everyone knows that the cheetah is perfectly morphologically adapted for high-speed running. But a wolf? Wolves do not share such adaptations as cheetahs, yet they are nearly two times as fast as an African Elephant. This pattern, where the largest animals are not necessarily the fastest, holds across ecosystem and movement types. But why is this, and what does this relationship tell us about the speeds of even larger extinct species such as dinosaurs? The cheetah is the fastest land animal on Earth. 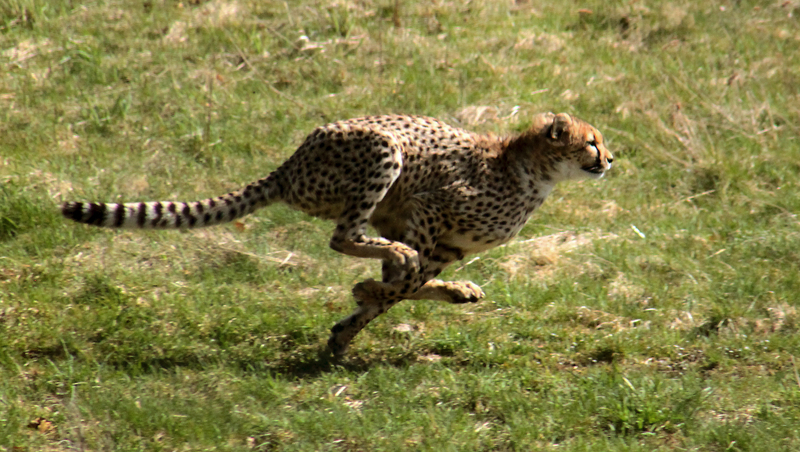 No surprise there - everyone knows that the cheetah is perfectly morphologically adapted for high-speed running. Yet a wolf, though it does not have such adaptations like the cheetah, is nearly two times as fast as an African Elephant (60 vs. 34 km/h). This may be new to some of you, at least it was to me. In ecology, we love our power law scaling relationships (just think of metabolism, feeding rates, growth rates, etc.). And if our data don’t fit, we assume we’ve done something wrong. When I started working on a project computing movement trajectories for species of different body mass, I used such power law scaling relationships for speed. I then ran my carefully developed model, got some really weird results, and became very frustrated with my apparent incompetence. When I finally identified the flaw in the model, I had a really good laugh: the speed scaling relationship I used computed elephants with a maximum speed of 600 km/h (honestly, I would be really afraid of such an elephant)! So, this was the first time I really started thinking about this issue of the largest animals not necessarily being the fastest. Although I would love to say so, I am of course not the first person to realize this. Others already came across this phenomenon in running animals but, interestingly, there was no mechanistic explanation for why this occurs. I started doing research on the maximum speeds of animals and soon realized that this pattern also seems to hold for swimming and flying animals, which so far had never been documented before. This made it even more interesting to me as I have a real predilection for generalities. 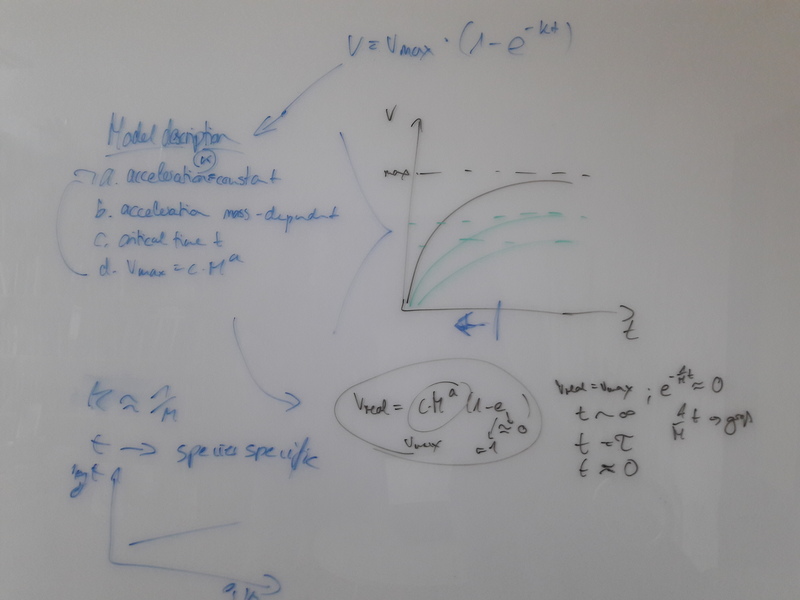 I recruited my colleagues (aka EcoNetLab) and we started discussing this by covering numerous whiteboards with scary mathematical equations. It takes an elephant longer than a wolf to accelerate to the same speed. Physically, this is due to mass-dependent inertia. There must be some critical time limit for maximum acceleration as energy isn’t infinitely available. These two assumptions together would already yield a hump-shaped pattern of maximum speed and body mass. It is not very reasonable, however, to assume the same acceleration time for species of different body masses. It makes much more sense that larger animals have more energy and therefore also more time available for acceleration than smaller ones. This gives us an allometric scaling of the critical time available for acceleration. Physiologically, this is due to a higher amount of muscle tissue and therefore ATP storage capacity in larger animals. So that’s it. All these assumptions together create a rather simple but powerful equation that perfectly fits maximum speed data across a staggeringly vast body mass range. The empirical data base we compiled to test this comprises 474 species ranging from 30 mg (a mite) to 100 tons (the blue whale) in body mass. We fitted our (seemingly magical) equation to flying, running and swimming animals individually and were surprised by how well it predicts maximum speeds across ecosystems and movement types, explaining almost 90% of all variation in the data. We were so positively surprised by our results, we couldn’t think of any more to do. However, thanks to our co-author Walter Jetz, we now have a paper with dinosaurs in it – pretty cool, right? He suggested to find out how well our model actually predicts the maximum speed of extinct species. So, we searched for highly accurate maximum speed predictions for dinosaurs based on detailed morphological and biomechanical models and compared them to the predictions produced by our simple model. Surprisingly, again, our model makes similar maximum speed predictions to that of the morphological models by only accounting for the body mass and movement type. We thereby found out that Tyrannosaurus rex was probably relatively sluggish, with a maximum speed of only 27 km/h compared to the much smaller Velociraptor, which reached top speeds of about 55 km/h. So, here are a few final tips: if Jurassic Park becomes reality, you might not need to be afraid of a T. rex running after you (except for me… I am so slow, I would probably be eaten). However, if you see a Velociraptor, you should do anything but trying to run away. Unfortunately, I don’t have any suggestions for alternatives, but running away will most likely be the last thing you do. Let’s just hope they stay extinct….